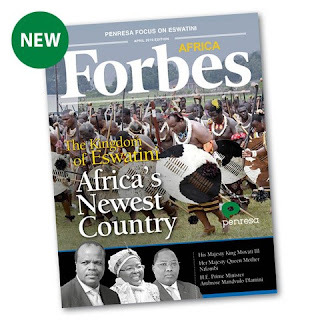 An article in the international business magazine Forbes Africa that praised King Mswati III, the absolute monarch of impoverished Swaziland / eSwatini, for his ‘his highest aspirations for the welfare of its people,’ that was widely circulated on social media on 1 April 2019 was thought by many to be an April Fool joke. Instead, it turns out the article was genuine; but it was not a piece of objective journalism, only public relations. It was produced by the marketing company Penresa and was published in the magazine for a fee. The cost has not been publicly disclosed. Penresa said the article was produced with the ‘guidance’ of Sibi Mngomezulu, eSwatini Ambassador in Brussels, and Christian Nkambule, eSwatini High Commissioner in London. The articles raised smiles among people with knowledge of the kingdom that has been in financial meltdown for years. The King holds power by banning political parties from taking part in elections and jailing those who campaign for democracy. The article referred to the Royal Family’s as intent on bringing ‘prosperity to the country with forward-thinking measures that are paving the way for the nation’s sharp national economic growth and modernisation’. The article did not say that when delivering the national budget in February 2019 Finance Minister Neal Rijkenberg reported Swaziland was broke and ‘facing an unprecedented economic crisis’. In his speech he said the ‘economic outlook remains subdued’. Foreign direct investment into the kingdom ruled by King Mswati who is sub-Saharan Africa’s last absolute monarch, was getting worse – with a contraction of 0.4 percent in Swaziland’s GDP for 2018. Forbes Africa made no mention of the vast spending by King Mswati and his Royal Family who continue to spend lavishly. The King has at least 13 palaces and fleets of top-of-the-range Mercedes and BMW cars. He and members of his extensive Royal Family (he has had at least 15 wives) live opulent lifestyles and are often seen in public wearing watches and jewels worth hundreds of thousands of dollars. The article in Forbes Africa was produced by Penresa which describes itself as ‘an independent consultancy agency, specialized in marketing and communication for emerging markets’. It said it targeted countries that are ‘casting off their former labels’.